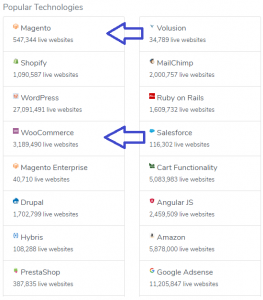 Magneto 2 Vs. WooCommerce – The Pros and Cons! The world of online stores is exciting but complex. There are many platforms from hosted solutions to open source solutions. There are hosted solutions like shopify, bigcommerce and others. Hosted solutions can work well for a small inventory of products but as an eCommerce store grows larger there are limitations on hosted platforms. Open source platforms offer you the freedom and flexability you need for your growing business. As for open source solutions there are many; here we will focus on Magento and woocommerce. Many platforms offer hundreds of customization options that allow you to create unique stores that fit all budgets. You no longer need to be a developer. You just need a good idea, a little research and a lot of enthusiasm for the project. Magento is the world leader in electronic commerce. It was created in 2008 in the United States and was bought by eBay in 2010, then sold to Permira, who later sold it to Adobe. It has two versions – a free one called Community and another paid one called Enterprise. It is the most robust and customizable platform, allowing us to build a custom solution for each application. Magento is a large platform so requires a bit of a learning curve . 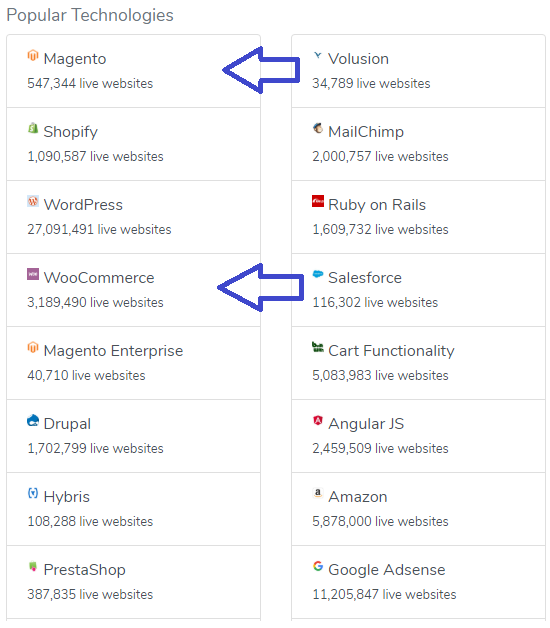 One of the biggest differences between Magneto 2 and WooCommerce is that Magento’s database is split up into more layers. This gives magento developers the ability to do a lot more on the customization side, the only real con here is that you will need more server resources and optimization to handle all the data. Fully customizable code using local override files so updates do not get overridden when upgrading. A powerful widget system allows admins to do complex customizations without hiring a developer. Magento 2 allows extensions to be purchased and installed from the market place without needing to hire a developer. Promotions, coupons, marketing deals can be created with a if this then that system. Finally, there is WooCommerce that is not a platform, but a plugin that is installed to WordPress. It was created in the United States in 2011 and purchased in 2015 by Automattic, a WordPress developer. Although it has a few configuration options, it is compatible with other plugins, which makes it possible to expand its use. It incorporates the necessary SEO fields for search engine positioning. 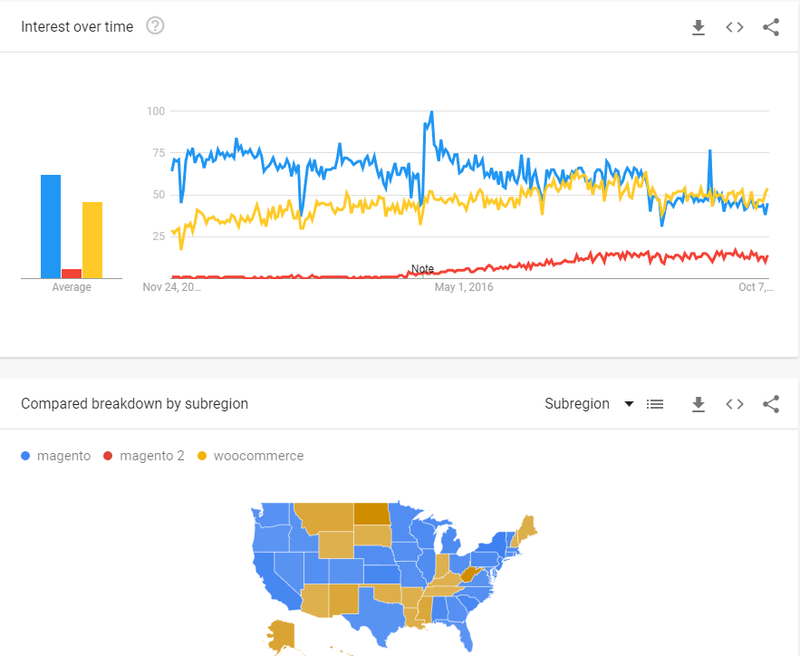 According to google trends when you add up both magento and magento 2 searches vs woocommerce you can see they are very closely tied in volume of searches. 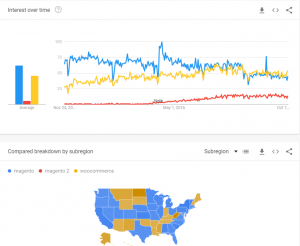 The only reason why “magento” searches are going down is because they are being replaced with “magento 2” searches. See graph below. On the other hand according to Built With, Woocommerce has 6 times more users. More users I think mainly because it is quite a bit cheaper to run and just the fact that so many people start with blogs so they are used to the wordpress platform. Both the platforms are Open Source. This means that they can be downloaded and installed for free. It is recommended to buy a suitable template, depending on the type of business you own. Magento has a lot more functionality out of the box then woocommerce but woocommerce has a lighter foot print. Conclusion: Which E-commerce Platform should you choose? If your just starting out Woocommerce can be a cost effective option if your on a shoe string budget, but once your making sales and can afford some development resources switch to Magento . The significant advantage of woocommerce is that it is more cost effective. You will find that the hourly rate of a woocommerce developer is likely lower as the skills required are lower. The difference in hosting costs can be very significant. Woocommerce can often be ran on a $15-$69 per month server where as Magento will likely require a $42-$89 for shared. Both platforms would need a dedicated solution once traffic and sales increase enough to warrant it ranging from 120-1200 generally. When clients ask me what I think about the Magento vs Woocommerce I respond with “Why would you buy a passenger van then try to retrofit it to be a cargo van, why not just by a cargo van.” Another words woocommerce is a modification to blogging software it is not at its core eCommerce software. Magento to launch ‘Magento Payments’ early 2019 but what is the fee structure? Magento announced they will be launching magento payments next year and this got me thinking. They say there is no subscription fee that is going to be great for the smaller companies but what about the larger ones. We need to find out what the fees are compared to authorize.net and paypal pro before we can recommend it to our clients. It looks like it is going to be a really great tool integrating Braintree Payments, PayPal Checkout, and Signifyd fraud protection. Here are some of the important benefits of Magento Payments that have already raised the eyeballs. It uses PayPal and Braintree to make it easy for merchants to accept different types of payment methods. Magento Payments has combined Braintree Payments, PayPal Checkout, and Signifyd fraud protection technologies to provide consumers with the best of everything under one name. Magento Payments comes with Cash Flow Manager that synchronizes order details and payments automatically within the Magento Admin. When this is released I will be investigating more details on this to relay. Currently most of our clients use authorize.net that automatically process the order and records the funds. I am unclear what the benefit is just now of this. They are going to handle the charge back cases and fraudulent charges. Leaving more questions. How will this all be handled. Overall for clients that are having fraud issues this looks like a good option. It seems like they collect data from all their partners/merchants if one receives a fraud alert then that card will be declined with any of the participating merchants. This collaborative approach could work well for everyone involved. As magento developers I hope it will be a cost-effective option for our clients. Bookmark and subscribe! I will release a more detailed updated blog post once more information is available. Why Use Magento to Design and Develop Your Online Store? Choosing a right CMS platform for your website may be a hard decision to make. But if you decide on the main purpose of the site: e-commerce or content, it will greatly facilitate the choice. Sure, you will be amazed at the wide range of options available to businesses if you are working on a website and are looking to incorporate some e-commerce features into it. Like WordPress, Magento is based on open source technology. This platform has many useful features for e-commerce, which has already been used by more than 150,000 online store owners, from small businesses to large multinational corporations. Magento Design comes with high-level customized features that give sellers the flexibility to customize online stores according to their business interests. It also provides multifunctional options like managing multiple stores, optimizing for search engines, generating reports, mobile trading, marketing and other life-saving important management tools. The Magento Design interface also allows the user to create a complex of content pages, menus and version control elements. In addition, Magento is one of the most secure e-commerce platforms that anyone can use. If you find that using Magento e-commerce platform is suitable for your business, go to the official Magento website and select your version of Magento. Enterprise Edition is a paid, customized solution that provides higher performance and scalability for fast growing and large enterprises. This solution will also give you access to expert support and hundreds of other features that you can use to manage the store, and therefore get more power over your site. Community Edition is available for free download and further directed at developers who understand the essence of Magento. This version of Magento is an open source solution and gives you access to community support, as well as other features user groups, adding product categories, coupons, etc. In addition, you will also be granted access to other functions, which can only be found in Magento, for example, multi-stores, related products, wholesales and cross-selling. 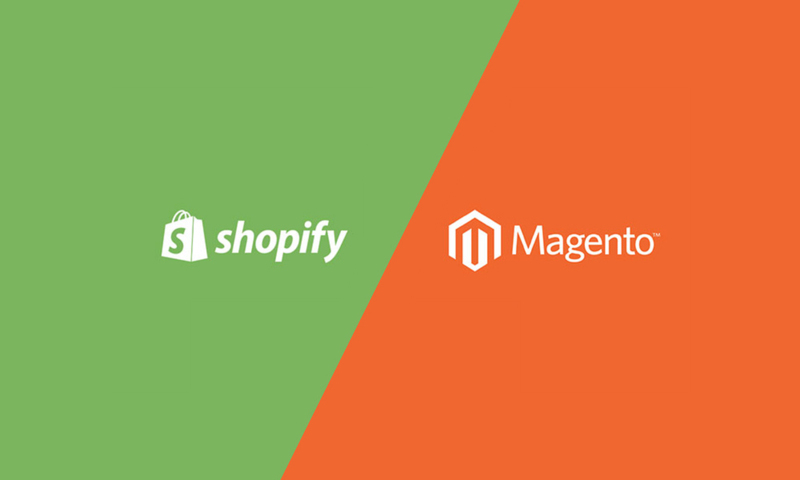 Shopify vs Magento: Which is the Better Platform? Selecting the right ecommerce platform is critical for your business. In order for you to thrive online, your business will need an exemplary website that seamlessly blends both physical and digital shopping experiences. Shopify and Magento are two of the most popular ecommerce platforms. Although both platforms are great choices, there is one that is sufficient for businesses of all sizes. To learn more about the dichotomy between both platforms, read on to obtain an insightful cost-benefit analysis. Magento is a world-renowned open-source ecommerce platform. The platform is commonly used by small brands and large businesses alike, as it’s more convenient to scale and customize for both B2C and B2B businesses. Magento is one of the fastest growing ecommerce platforms, thanks largely in part of its exceptional customer service, user-friendliness, and its easy-to-use shopping cart system. Magento is also equipped with vital internet marketing capabilities, allowing users to leverage their SEO from its unique interface. Though, it’s important to note that Magento self-hosted, providing users with the capabilities of designing their own custom online store without any limits. Nonetheless, Magento is the perfect platform for businesses of all sizes, and it’s versatility is ideal for businesses anticipating eventual expansion down the road. Shopify is a Canadian ecommerce platform that gives users the ability to manage multiple sales channels, stock items in an unlimited inventory, and achieve single-step order fulfillment. In the broadest sense, Shopify allows its users to perform virtually any task from its platform. Additionally, the platform isn’t too technical and is ideal for ecommerce beginners. However, one major drawback of this ecommerce platform is that it’s not optimal for businesses anticipating future growth. Although there are regular updates to Shopify’s system, your online store will only be a great as the platform. From a business standpoint, Magento is the better ecommerce platform, primarily because it allows custom development using local override files making customizations convenient and quick to create. On Shopify, it’s much harder to make simple customizations, requiring a complete custom extension to be developed. Generally speaking, Magento allows you to personally own and operate your online store. With Shopify, however, it feels more like your renting your store. They’re in control. As a result, Magento is the most ideal ecommerce platform for businesses who desiring to fully customize and have control over their online store. If you would like to learn more about how you can use Magento for your business, visit our contact page for more information about how you can reach out to our award winning team at Towering Media. For users of the system, Magento Provide Support offers a special module for easy and fast integration. A wide range of all kinds of settings will add an online chat button to any place on the site and select any set of chat buttons from the gallery or load up your own images. Use the chat buttons specified in the Provide Support settings. Possibility to set links for own images of chat buttons. This option is very useful for those cases when you use one account on several sites. It allows you to use different images of chat buttons on your sites. Place the chat button in the position predetermined by the theme of your Magento site. Add a chat button to a fixed position in the browser window. This will allow you to make a chat button tied to a specific place on the site and allow it to remain visible when site visitors scroll the page. 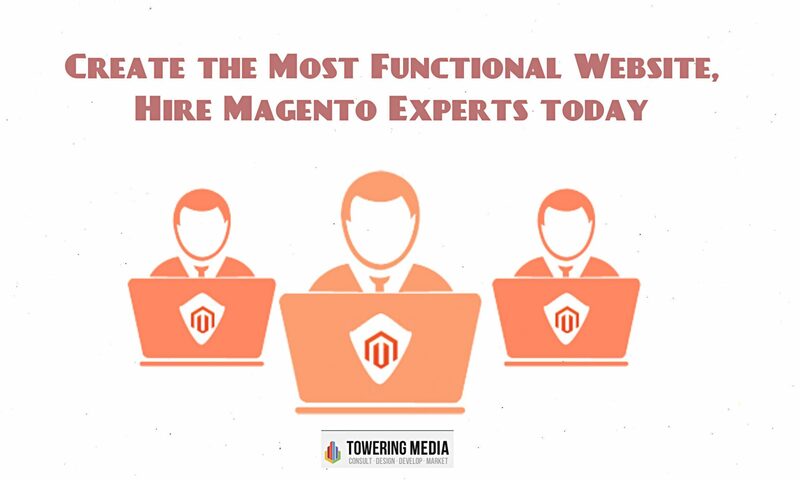 For this purpose we at Towering Media offer a rich selection of support method for Magento consultants to our customers. Here, you can find a fair list of support options which you can access at anytime. Our support team is always ready to a help you! In the field of computer programming, being a Magento Designer means having specific skills to design, set up, operate and evolve an e-commerce platform. An ecosystem and computer tools are to be mastered. A computer programmer who wants to specialize in the development of a platform or application Magento must master primarily object-oriented programming. He is able to develop at a high level with the PHP language. His knowledge of the web environment and the specificity of programs running server-side, client-side commands or manipulations are essential. The developer must master the key concepts and the ecosystem. It uses the programming tools which are integrated in Magento. It exploits the web services that optimize the online application. The developer is required to provide a standard for site safety, quality and performance. Its mission can be punctual like the customization or the configuration of a module. Being a computer science graduate with the knowledge of PHP language and the MySQL database can shorten your career path to become a Magento designer. Many learning materials and books are available to convert to Magento. Training organizations offer an interesting curriculum that allows you to master the various aspects of the development and integration of e-commerce software. How to Integrate a Magento Developer into your E-commerce Project? If you have an e-commerce site based on Magento, you know that to support the development of your site, you will regularly need to make improvements projects or install patches. Like other actions in Magento, the development and creation of modules or even the modification of a design are actions to be carried out by your technical team of integrators. If it is composed of a Magento expert with a developer training in PHP, everything is fine; you have all the elements to move forward. The topic of performance is very important for any Magento Agency. As Magento-specialists and through the support of more than 40 shops, the topic of Magento performance occurs daily in a variety of forms. The reasons for a slow online shop or individual very slow areas in the shop can be very different. So the “performance brakes” can have their causes in the hosting, in the code, in the structure but also in the operation as well as the configuration. At the beginning of each Magento performance optimization is an individual performance analysis through our certified development and technology. Your contact person and a detailed consultation will then lead us to a stand. Magento Agency gives you the guarantee for your long-term Magento online trading success. The experience has shown us that our most successful Magento shops are always based on long-term, secure e-commerce support. As a Magento agency, we can fully exploit the long-term optimization potential as well as respond to short-term problems, necessary adjustments e.g. through your seasonal business or general changes in the e-commerce environment. For this reason, we offer our Magento customer care contracts, which make it possible to book monthly hourly quotas flexible development, technology, SEO and consulting. We take over technical SEO for you, increase your regional awareness through local SEO and create SEO texts. Magento is one of the leading open source platform used for creating online stores. Today, there are many Magento programmers available who can help you to create an exceptional online store. However, not everyone is expert and provide you what you want. So, you should look at all the aspects like experience, expertise etc. Outsourcing talented developer from a web development organization considered best path for custom development and customization of online business based online store. On the a different way, Magento designer an individual can get most extreme expert internet business arrangement. Contract committed Magento Programmers for best reconciliation benefits at last aides in reclassifying a web-based interface prompted high level of intelligence alongside enhanced online nearness. Curiously, there are a few advantages of procuring Magento proficient from web development organization. Outsourcing devoted web engineer can be greatest preferred standpoint for a person in the event of stage-by-arrange development fill in as a specialist will be exclusively committed to specific extend from beginning to end. Over that, by employing web software engineer, an individual can essentially convey the development rate down up to some degree. Because of adaptable employing plans, one can contract talented Magento programmers from a web development organization on full-time, low maintenance or hourly reason for Magento based modified online-store solutions. By methods for Magento fuelled online eCommerce site, a man can get a multi-store retailing usefulness alongside various business development alternatives, simple to-utilize administrator system, client account service system, plan following and service, inventory service/perusing and so on. With the nearness of umpteen online business solutions, it is very troublesome for a person to choose the best one for incredible outcomes. Determination of best CMS and web application for the most part relies upon the business necessity. If that a man needs to redo his site by utilizing Magento applications then just Magento designer can help for the same. Pick right software engineer for best outcomes and high ROI. When looking for professional Magento Programmers, it is important to shop around. Look for a company that has years of experience in serving a wide assortment of platforms. If you are looking for a right platform, then look no other than Towering Media. Magento is one of the sharpest and most powerful E commerce platforms accessible on the web and has been making shopping on the web simple for clients everywhere throughout the world since several years now! A Magento developer can help you to develop the right site for your needs. Magento development prompts very imaginative, inventive and exceptionally utilitarian shopping basket frameworks which come to a great degree helpful for online stores and E business sites. This E business platform isn’t just a single of the most looked for after, however Magento E Commerce Development is viewed as a standout amongst the most secure and most solid among its counterparts. Magento development services are quick, simple and flexible. While Magento is pressed with a considerable measure of highlights, its greatest resource is its capacity to refresh Magento E Commerce sites consequently. This platform isn’t just an effective E commerce platform, however it is additionally a reasonable promoting platform and offers numerous publicizing highlights as well! Things being what they are, returning to the principle question, why is Magento Development considered as the most ideal approach to create and design online stores? It is an open source plan platform and in this way is light on the pockets. Source codes are available to the general population; in this way it is straightforward. It is considered as a worldwide shopping basket platform and is used broadly and widely. Adaptable and adjustable; can be utilized to tailor plans according to necessities and prerequisites (and budget). While the above can be considered as brief focuses to contemplate, there is substantially more to Magento Development and Magento E commerce than what meets the eye. Magento E Commerce Development offers Multiple Website and Store Support to help advance your stock crosswise over various spaces. Moreover, Magento is a design based MVC framework and backings augmentation and adjustment of its capacities. Magento Development Services are likewise extremely mainstream because of the way that the E Commerce platform accompanies many paid and free expansions in its online index known as the ‘Magento Connect’. To the extent Magento’s CMS is concerned, it too is easy to understand and functions admirably. Everything accompanies a ‘setting’ where you can be accountable for what you need to control. Magento Development is likewise bug free. The main drawback is that it isn’t anything but difficult to introduce! In any case, you can discover numerous recordings and instructional exercises online to enable you if you to get stranded mid way! Generally, Magento has set the bar high for its counterparts. It offers list service; i.e. enables clients to peruse lists and items continuously. To the extent cell phones are concerned, Magento consequently finds versatile programs and work area programs, and shows the site as needs be. It is additionally conceivable to make a SEO benevolent site by utilizing its SEO supporting highlights like Google sitemaps or auto produced seeks. Magento likewise offers Order Management, i.e. the platform contains highlights like assent seeing, altering, pressing slips, making receipt, shipment and credit update per arrange. Magento internet business arrangements give Magento site customization, multi estimating highlights, assess rate bolster, different cash support, and numerous installment entryways joining. If you are looking for a professional Magento developer, then you can contact Towering Media today! Online business or eCommerce is blasting and has turned into the main trillion-dollar industry that enables online retailers to offer effortlessly. Within excess of 2,00,000 online stores fueled by the Magento stage, it has helped retailers to confront the intense aggressive market and make due by offering best in class highlights and functionalities. Magento experts assume an incredible part in making your site fruitful that further changes over the guests into purchasers. 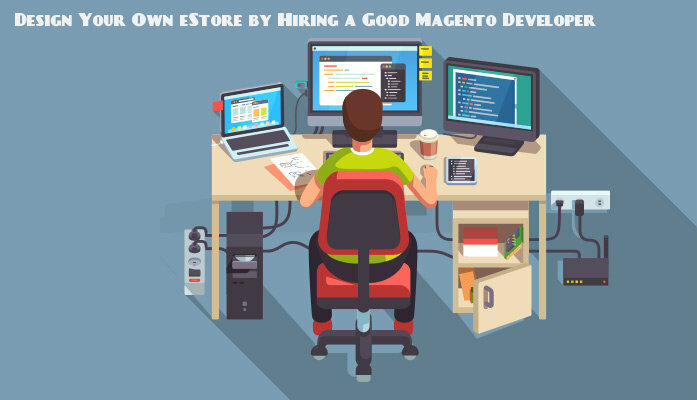 Thus, in this bit of composing let me share with you how your Magento experts can advance your online store and furthermore execute essential improvement tasks that will help you to remain profoundly focused in the market. Over half of the online business traffic comes through different cell phones and m-trade is the default methods for shopping on the web. Magento engineers can help you to receive the multi gadget approach by using a responsive design and actualizing highlights that are prescribed by Google and guarantee simpler upgradability. Each online store is extraordinary and has one of a kind prerequisites particular to the business. They offer diverse kinds of items and furthermore target distinctive client base. So from the advertising point of view, a modified topic will change over than any free Magento topic. The engineers can construct a site that will feature your image picture and the topic likewise speaks to your corporate character. Magento is an advancing eCommerce platform and concocts consistent redesigns and new highlights. Proficient Magento experts having knowledge help to influence the store to perform taking care of business. Once the client achieves the shopping basket page, half of your fight is won. All that is required is to urge the guest to continue to look at and make an exchange. As a matter of course, the topic that is utilized isn’t advanced for transformation. Magento experts can enable you to advance the shopping to truck page by changing the format, shading, measure and so on that satisfies the clients to accept a viable call to activities. If you have plans to offer your items all around, at that point it is vital to focus on your clients in different areas: creating multilingual sites can enable you to serve your clients in a superior way and furthermore to influence them to feel more great by showing a site in their neighborhood dialect. This frequently builds the business transformation. Bringing deals to a close and creating higher incomes is one of the prime focal point of any online web based business store. Magento experts can help you to accomplish ideal deals by executing certain tips for better deals.